SKU: N/A. Tags: custom door hangers, Door Hangers Printing Adelaide, Door Hangers Printing Albany, Door Hangers Printing Albury, door hangers printing australia, Door Hangers Printing Australian Capital Territory, Door Hangers Printing Ballarat, Door Hangers Printing Bathurst, Door Hangers Printing Bendigo, Door Hangers Printing Bowral, Door Hangers Printing Brisbane, Door Hangers Printing Bunbury, Door Hangers Printing Bundaberg, Door Hangers Printing Busselton, Door Hangers Printing Cairns, Door Hangers Printing Canberra, Door Hangers Printing Coffs Harbour, Door Hangers Printing Darwin, Door Hangers Printing Devonport, Door Hangers Printing Dubbo, Door Hangers Printing Geelong, Door Hangers Printing Geraldton, Door Hangers Printing Gladstone, Door Hangers Printing Gold Coast, Door Hangers Printing Hervey Bay, Door Hangers Printing Hobart, Door Hangers Printing Kalgoorlie-Boulder, Door Hangers Printing Launceston, Door Hangers Printing Mackay, door hangers printing melbourne, Door Hangers Printing Mildura, Door Hangers Printing New South Wales, Door Hangers Printing Newcastle, Door Hangers Printing Northern Territory, Door Hangers Printing Nowra, Door Hangers Printing Orange, Door Hangers Printing Perth, Door Hangers Printing Port Macquarie, Door Hangers Printing Queensland, Door Hangers Printing Rockhampton, Door Hangers Printing Shepparton, Door Hangers Printing South Australia, Door Hangers Printing Sunshine Coast, Door Hangers Printing Sydney, Door Hangers Printing Tamworth, Door Hangers Printing Tasmania, Door Hangers Printing Toowoomba, Door Hangers Printing Townsville, Door Hangers Printing Traralgon, Door Hangers Printing Victoria, Door Hangers Printing Wagga Wagga, Door Hangers Printing Warragul, Door Hangers Printing Warrnambool, Door Hangers Printing Western Australia, Door Hangers Printing Wollongong, door hangers sydney, full colour door hangers, custom door hangers Printing, die cut door hangers Printing, door hangers Printing, door hangers Printing services, embossed door hangers Printing, foil stamped door hangers Printing, full color door hangers Printing, high quality door hangers Printing, large door hangers Printing, rip door hangers Printing, thick card door hangers Printing. Door Hangers Printing is now very commonly used but effective marketing technique. It is not only affordable for business but it reaches directly to customers door and that delivers maximum potential information to your clients. We can differentiate your door hangers uniqueness with better design and by having quality printing from online commercial business. We have variety of stocks available, such as 210 GSM Cardstock, 300 GSM & 350 GSM Cardstock whereas we offer thick cardstocks as well such as 400GSM or 450GSM. 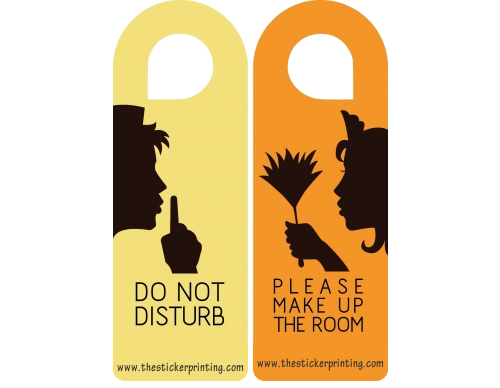 We use CMYK and PMS printing techniques to print your door hangers. 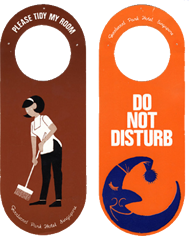 We can apply custom die cutting on your door hangers, you give us any shape you like and we can cut your door hangers in required shape or design. Door Hangers are being considered as highly ingenious marketing and branding strategy which have gained an unprecedented level of recognition. Whether it is a product or service oriented business establishment, it is a perfect promotional tool that a business can have. As a result, today many customer are taking its advantage and implementing in their business. If you want to create the loyalty card program, then it is really very essential to accept a product which will create a great impact on the customers along with the place across. This is where a door hangers have come into play. Today in this highly competitive market, it is very essential to have an effective promoting tool for the firm’s marketing and branding objectives. 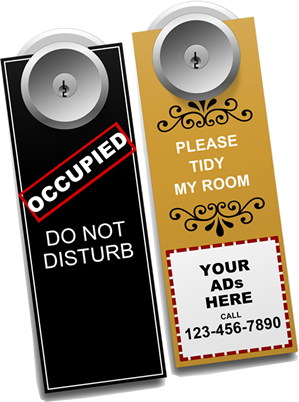 Door hangers are one of the most inexpensive selling tool that has the potential to attract traffic to your door. They are an inexpensive, effective method to promote sales. It helps in producing high ROI and increase sales from repeat customers while attracting new ones. They’re a superb selling promotion that helps in building your whole by keeping your business before of your targeted market. 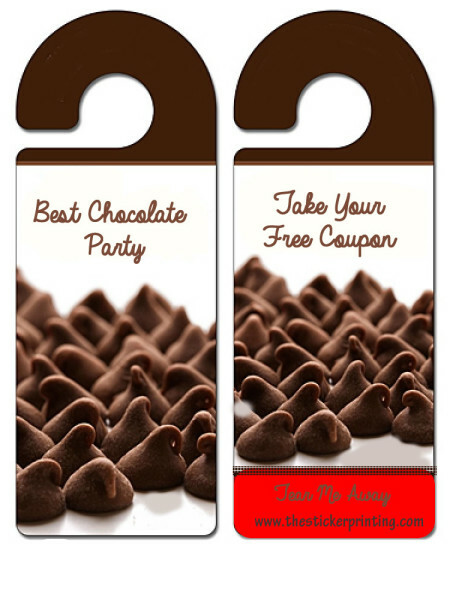 Thus, for getting a perfect advantage of door hangers, all you need is to have a right printing service provider who should have a years of experience in handling door hangers printing and “The Sticker Printing” is the only one where you could get the high quality of printing needs at reasonable rates. For businesses that require to grow, door hangers are the perfect option for you. 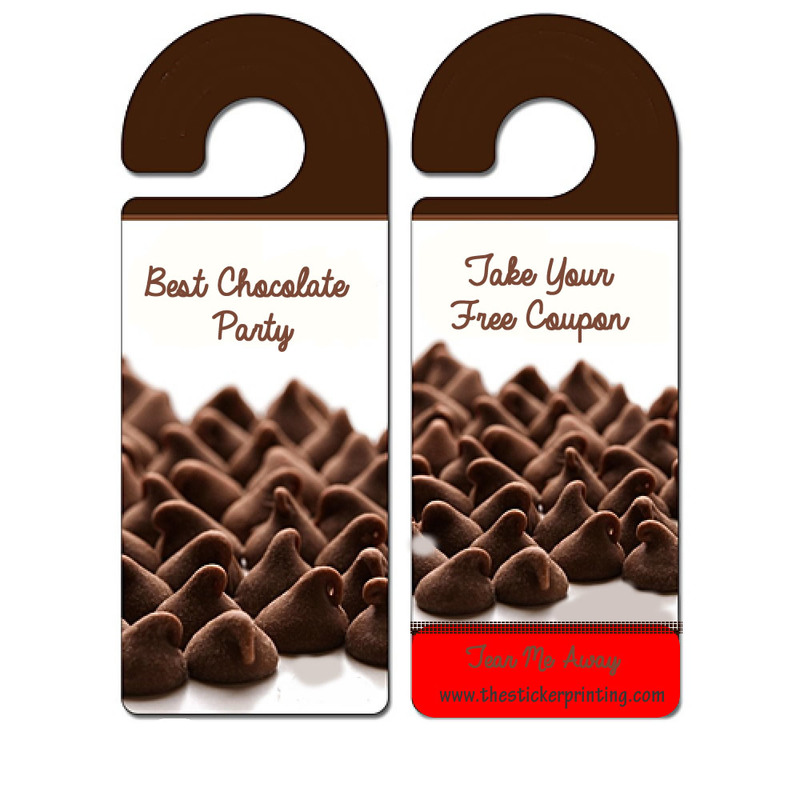 Those who are looking to attract new sales for any business, can go with these door hangers. Whether it is of home repair services, IT school services, neighborhood distributors of home merchandise and services, or any other services, door hangers is the best option that you could have. 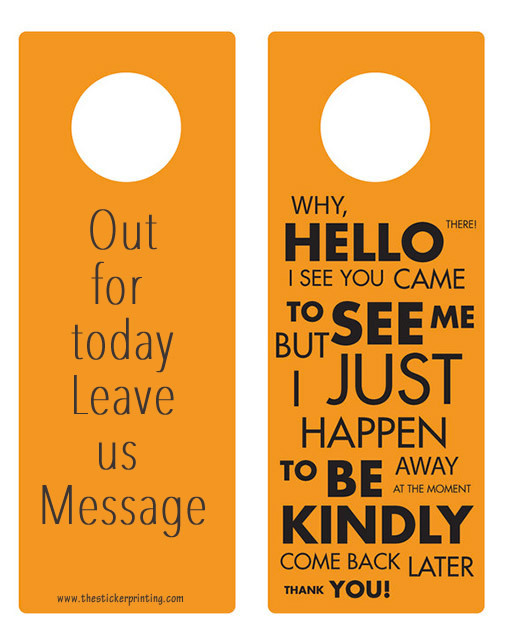 The sizes which we offer for the door hangers are 8.8cm x 21.5cm, 8.8cm x 28cm, 10.5cm x 28cm and 10.5cm x 36 cm. Besides all, we also provide customized printing as per your needs. 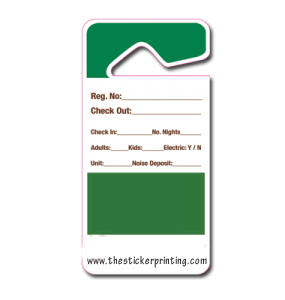 The Sticker Printing offer free designing services and our printing is done at affordable rates. Feel free to contact us in case you have any questions. We offer 24/7 customer services via email, phone call and chat support. Well I am an interior designer and hence everything should be perfect for me….. So, when the question comes to door hangers, without any hesitation, I simply place my order to the sticker printing service provider and as always……PERFECT! !